Wonder Woman is another video slot from Playtech that is part of the popular DC Comics series – with 5 reels and 30 paylines, you can spin away on desktop, mobile and tablet devices from 15p to £300 per spin. It comes with a total of 7 bonus features which reward you with transforming symbols, extra wilds, respins, free spins and 4 progressive jackpots. With comic book style graphics, you see Wonder Woman take on The Cheetah as they battle for control of the Amazon – visually superb, you are taken to Paradise Island which has a Greek mythology feel. With A, K, Q, J, 10 and 9 playing cards on the reels, you’ll also see characters Ares, The Cheetah and Wonder Woman. The Cheetah is the most valuable symbol with 5 rewarding you with 75 times your total bet. The Wonder Woman logo is the wild symbol and performs all the usual substituting duties (bar the scatter of course) – 5 on a payline will reward you with 125 times your bet. You’ll notice 1 symbol can appear heavily stacked on 1 or more reels – this is known as the Stacked Symbols feature. There’s also a Fire Wild symbol which appears on the middle reel in the base game – when it appears, you will play the Fire Wild feature which displays a high value symbol and turns all other same symbols into wilds for your current spin. Look out for Wonder Woman taking over both reels 1 and 5 simultaneously – this will activate the Wonder Woman Respins feature where all triggering symbols remain sticky. The other reels respin with just Wonder Woman and blank symbols appear. When a new Wonder Woman symbol appears, it will lock in position with the other reels respinning. This continues until no more Wonder Woman symbols show up – you will get a bet multiplier which can reach 1,000 times your bet (for 20 Wonder Woman symbols). Finally, there’s The Cheetah feature in the base game which is played when the Barbara Ann symbol appears fully on reels 1 and 5 simultaneously – all highly rewarding symbols on the 3 central reels transform into The Cheetah which is the most valuable symbol for enhanced payouts. Wonder Woman Free Games feature – 1 symbol (either the 10, Q, A, Steve, Diana or Ares) will be stacked on each reel. You’ll win 3 or 12 more free spins for 1 or 2 scatters. The Cheetah Free Games feature – winning combinations from a higher value symbol will see them transform into The Cheetah symbol for the remainder of the feature. This means the values for the high value symbols increase to the top paying symbol. 1 or 2 scatters will reward you with 3 or 12 extra free spins. Fire Wild Free Games feature – the Fire Wild symbol now appears on reels 2, 3 and 4 as opposed to reel 1 in the base game. When they appear, a high value symbol is chosen – all instances then become wild. If you get 2 or 3 Fire Wild symbols, 2 or 3 high value symbols change into wilds. Like the other 2 features, 1 or 2 scatters will give you 3 or 12 additional free spins. Being a DC Comics series video slot, Wonder Woman gives you the chance to win 4 progressive jackpots – you enter the jackpot game randomly from any spin. Here you need to pick from jackpot icons to win either the Mini, Minor, Major or Grand progressive jackpot. The latter will offer you a minimum of £200,000 but it normally between the £500,000 and £700,000 mark. 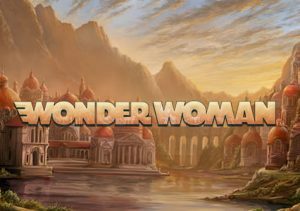 Wonder Woman is another great video slot from the DC Comics range – it’s highly volatile but can provide wins of 3,750 times your bet if you get wilds in all positions. The Cheetah Free Games feature can also pay dividends as filling the reels with The Cheetah will reward you to the tune of 2,250 times your bet. High variance, it looks good and plays out rather nicely – overall, another top creation from Playtech. If you like the comic book style, Aquaman (from Playtech) is worth playing – I also suggest Suicide Squad which is based on the blockbuster film.